But … but … ai is alreddy skwishifyed!! Fankeez, anni. Doze gyes shoor duz luuk snuggifyed! Kawmitty D sizhuns nawt allwayz teh besst. Yeh, doze gyez awn teh egstreemz alwayz wants der way, skwishin us inna middlol. Teh kommitee shud desyding if kommitee desizhunz ar befft? Teh furrst funkshun uvva kawmitty iz 2 C-kure teh sir vYval ov teh kawmitty. We nead a moar beeg wun! Plz tu ignyting teh sekunderry bakkup sun. Dubblol kongrats, anni! Kyoot lol! Thx! Dem iz 4 littlol kyootiez! Ai gree! congaz uv awl kynds, N fack, CongaKommittee 2 owr own annipuss! Hao come ai alwais get teh owtside spawt ?? And teh gud nooz for the norfurn hemisphere is that the beems will get longer berry berry soon! Iffen the Mayapocalypse duds out, dat iz..
No erffkwayks? No lytning commin owtta teh grownd? No seering plazma shooting owt frum teh sun tu evaporayt owr atmosfeer? Duz dat meen Ai wull hab 2 du teh howsewerk affer awl?! O, dat is nermul fur me, but puddy iz heer fur Krissmuss and BIL bizits awn teh 26fth, soe Ai muss get sum uf teh stuff awf teh tablol soe we can bofe eet at teh saem tiem! In fact, it am a gud gud day faw a biek ride !! pb sez, iz awwayz a gudgudgud day faw a biek ryD! Tru, dat. Finkso weer stil heer. Noozpeepz sez dey just runned owt ub spais nd dint getz a chantz tu maik a nu calndur after teh spanyurz caim nd kilt dem. *ahem* Aifinks dat “noo calendur” is whut kaym wiff kissymiss. heers teh burfday fairy, a liddle alte today cawz i wuz habbing lunch wif my long-losted bruvver hoo iz viziting frum Down Under, to say HAPPEE BURFDAY to Aliceflynn, TheCatsMutha an evreewun else hoo haz a burfday today! i haz bringd yummy fudjy burfday caeks, wite caeks wif peppymint frosting, iskreem, sparkly party punch, fansee shiny party hats, an goodie bags filled wif lite-up paddolball games, snowy Cheezland snoglobes, kandee, an ginjurbred man stikkers wif stikker decorayshuns to stik on! an a big swish ob teh burfday wand to making all yor burfday wishes come troo! Ooo, Lite-up paddlol-ball games !! Hey!!! I’ll lite u up!!! Just checking in tew sii if PB wuz still alibe. but thar wuz still an hour left. Teh way ai finks ob it, himz a littlol erlier den ai is, but on tumorro. Okay, this was too ridiculously cute to not share with, well, everyone I know via every channel I have. Keep in mind, Angel adopted Cory when he was a 2.5 week old orphan… and he’ll be 4 years old in April. He was soooo blissed, practically in a trance, by the time I got this video. When he snuggles daon under her, it makes me wanna… Idunno, splort or skwee or get leeky ais or sumfing. Teh lubs, it warms mai hart! aaawwww! dat is sooo sweeet! Me tuu! But, onistly, it rly was coming up on 4 years ago!!! And fur awl taht time, teh onlee fing the bear-cat rly unnerstands is lubs, neber had ennyfing else since teenytiny. Tiem Ai got 2 bed – see u awl 2 morro unless……! Wee kan haz snoe shovals? Wee kan haz snoe plowz? 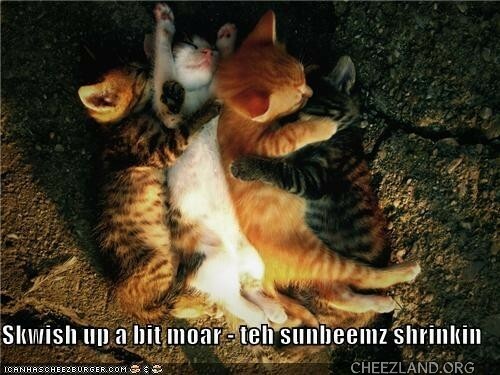 Wee kan haz, ohekwifitijusstasleep…..
du u noe, teh kittehs born dis juli durin teh 100 plus degree daiz- teh dai dey wuz borned wuz 106- dey aer NOT amuused! dey iz lukin owt ob der howse, goin wut, wut, wut IZ dis stuff? iz cold, an wet, an yucki!! tigger jus followz me arownd liek ebree yeer, seein wut i am takin pikshurs ob, an teh kittehs luk at him liek he iz teh crazi, lol. He lieks to ‘snowplow’ frew teh snow. he iz also teh wun hoo plais in teh wader puddels in teh summer. Ai muss hab kome owt teh rawng door … Whair am teh door tu summah ?? Fanks ebrebody for the nicy commenta about me Buttercup yesterday. Just got the interwebs back so I could see dem. She is much bigger now. Fanks to _yu_ for sharing Buttercup’s loveli baby-pixure for us to enjoy, Mareelouise!! In Cheezland, the time is 04:57.